I've become a big fan of Diana Gabaldon's "Outlander" series of historical novel/time travel stories featuring Jamie and Claire Fraser. Their adventures begin in Jamie's native Scotland in the mid 1700s. Gabaldon describes, in some detail, what daily life was like in that time, including what people ate. It appears that much of the Scottish diet at that time was made up of meat or fish. So when I first encountered a character in one of the books talking about "parritch," I thought he meant "partridge." As it happens, though, he was talking about porridge, or what we Americans call oatmeal. 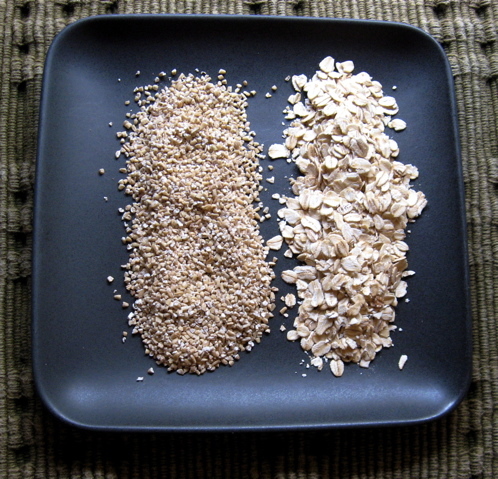 OATMEAL - on the left, steel cut oats; regular rolled oats are on the right. 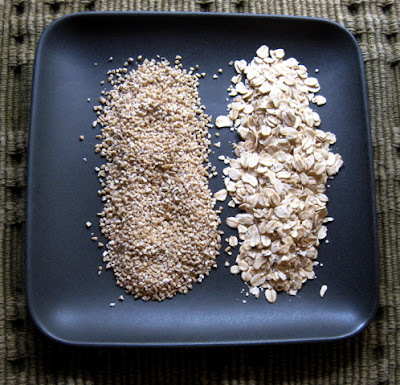 If you've never made this version of oatmeal at home, dinna fash yourself, as Jamie would say. It's very easy. And verra, verra tasty. Before you go to bed at night, pour 4 cups of water into a medium-sized saucepan. Add a dash of sea salt. Bring to a boil. Add one cup of steel cut oats. Give them a quick stir. Put a lid on the pot and turn off the heat. Let stand overnight on the stove top. When you get up the next morning, the oats will be cooked through. All you have to do is heat the oatmeal, dish it up in a bowl, pour on a wee bit of milk and you have breakfast. Some people like to sweeten their "parritch" with brown sugar or maple syrup. I prefer to add fruit - dried in the winter and fresh in the summer. A sprinkle of almonds or walnuts is verra nice. And ye'll ken that a pinch of cinnamon or nutmeg would be lovely, too. For more about food inspired by the Outlander stories, visit Theresa's clever blog, The Outlander Kitchen. She begins each post with a food-related excerpt from one of the books and follows it with a recipe. Examples include: "Fiona's Ginger-Nut Biscuits from Drums of Autumn," "Honey-Buttermilk Oat Bread at Madame Jeanne's from Voyager," and "Dougal's Poached Peach Sundae." Great storytelling and great food - what could be better, aye? Can't get enough OUTLANDER? Visit my Outlander Plant Guide for a wee bit more information about the plants featured in the series.